The OMEGA RR40S-HX1/8 Short Handle Reversible Bit Holder Roller Ratchet, 1/8'' Hex Drive is one of thousands of quality tooling products available from MRO Tools. 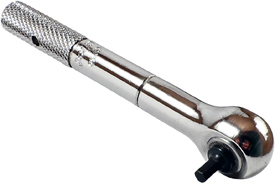 Please browse Roller Ratchets With Replaceable Bits and Bit Holders for tools similar to the OMEGA RR40S-HX1/8 Short Handle Reversible Bit Holder Roller Ratchet, 1/8'' Hex Drive. OMEGA RR40S-HX1/8 Short Handle Reversible Bit Holder Roller Ratchet, 1/8'' Hex Drive description summary: OMEGA Roller Ratchet® functions as a hand ratchet, yet its size greatly increases its versatility by allowing it to be used in tighter areas. These Roller Ratchets® can be used for both removal and installation purposes. Quantity discounts may be available for the OMEGA RR40S-HX1/8 Short Handle Reversible Bit Holder Roller Ratchet, 1/8'' Hex Drive. Please contact MRO Tools for details.